"Take the Shinkansen from Shin-Osaka Station to Maibara Station. 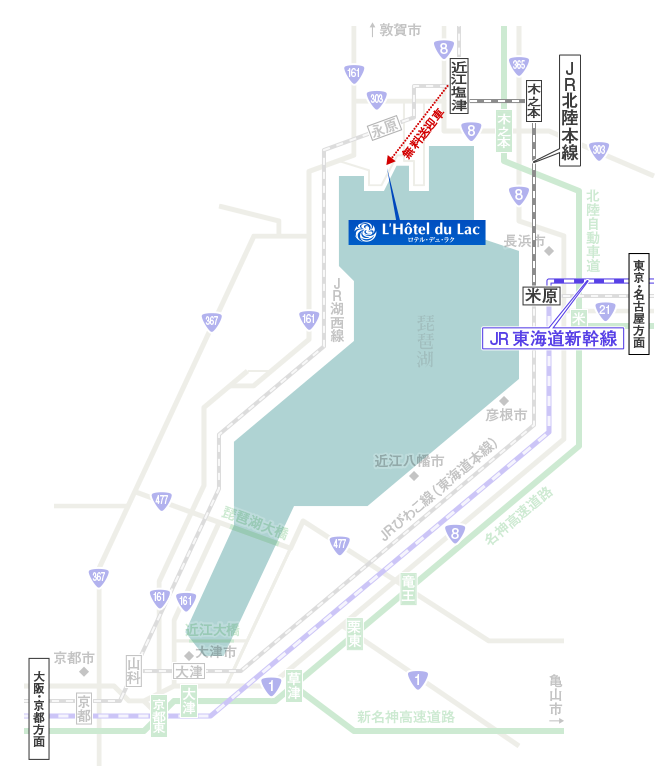 Transfer to the JR Hokuriku Main Line and get off at Omi-Shiotsu Station. Free courtesy car pick-up is available from Omi-Shiotsu Station." Alternatively, take the Tokaido Sanyo Main Line Special Rapid Service from Shin-Osaka Station to Yamashina Station. Transfer to the Kosei Line at Yamashina Station and get off at Nagahara Station. Free courtesy car pick-up is available from Nagahara Station. Take the Shinkansen from Shin-Osaka Station to Maibara Station. Free courtesy car pick-up is available from Omi-Shiotsu Station. Via the Tomei Expressway (Komaki Junction), take the Meishin Expressway toward Osaka. From the Maihara Junction, take the Hokuriku Expressway toward Fukui/Ishikawa. Get off at the Kinomoto Interchange and head west on National Route 8. Turn left at the Shiotsu intersection and head west on Prefectural Road 303. Turn left at the Oura-guchi intersection and head south on Prefectural Road 557, then turn right at the Oura intersection and head west. 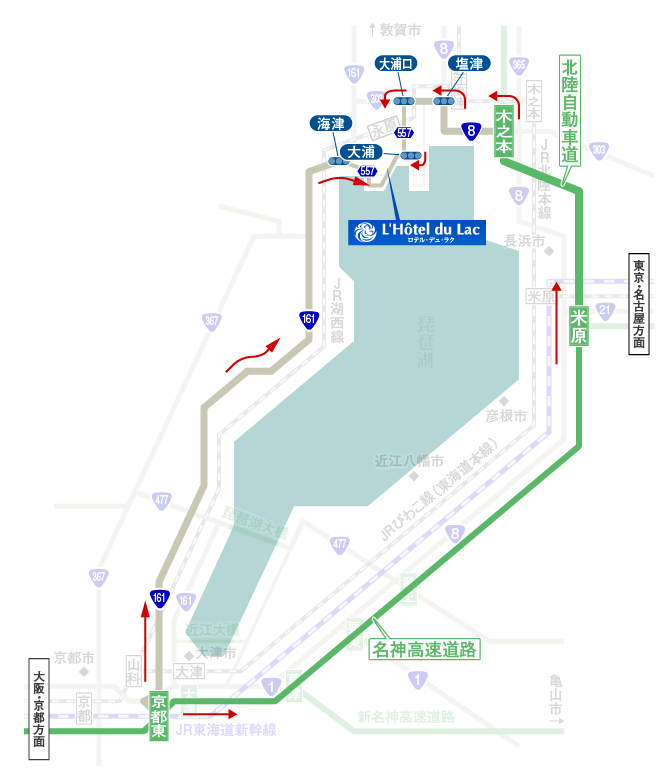 The hotel is approximately 20 minutes from the Kinomoto Interchange. 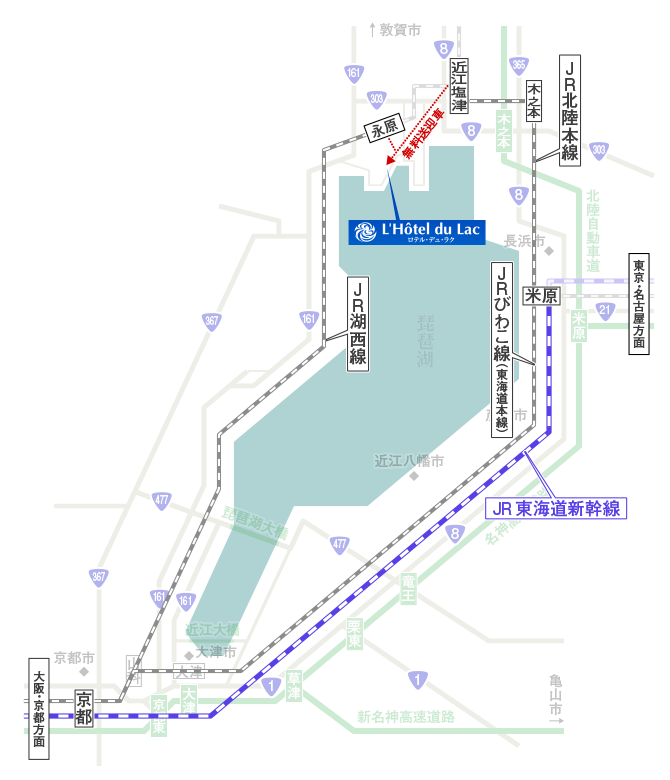 Via the Meishin Expressway (Kyoto-Higashi Interchange), take National route 161 toward Tsuruga/Takashima. 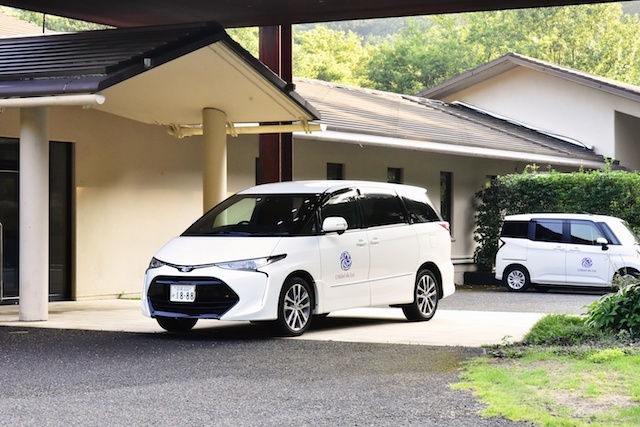 Free courtesy car pick-up is available from Omi-Shiotsu Station and Nagahara Station.